The 5th Border Management and Identity Conference on Technical Cooperation & Capacity Building (5th BMIC) is organised by the International Organization for Migration (IOM) and APSCA and supported by the Ministry of Foreign Affairs of Thailand. It will be held on 11-13 December 2018 in Bangkok at AVANI Riverside Bangkok Hotel. This international event is the largest gathering of National Government Authorities including Immigration, Identity, Border Control, Civil Registration, Customs, population management and other agencies with responsibilities in the area of Border and Identity Management in Asia. The objective of the 5th BMIC is to improve border and identity management in the APAC region through closer consultation and cooperation between national authorities responsible for border control, national identity and their key international partner organisations. Today the volume and frequency of cross border movements, and more specifically of cross border migration is rapidly changing.Whether customers are travelers, citizens, migrants or refugees, government authorities responsible for border and identity management are facing difficult decisions. Government authorities must not only adapt to changes in customer flows and the services that they must deliver to customers, but they must also evaluate an increasing variety of new solutions some of which are based on radically different approaches to border and identity management. The difficulty of all levels of decision-making is compounded by the fact that many of these new solutions are based on emerging technologies and new approaches for which international standards are not yet developed or finalized, and for which business models are not yet mature. Today government authorities are likely to be evaluating new approaches and solutions where identity data and events are stored in cloud servers and/or in mobile devices that they do not own, or even in a distributed ledger [e.g. blockchain] with multiple copies of data and transactions. They are likely to be evaluating a variety of new technologies offered by traditional identity and border management solutions providers, as well as new approaches and solutions from technology companies and organisations with whom they are less familiar. Furthermore, these new approaches to border and identity management, whether based on new technologies or new thinking, will need to be integrated with their existing border and identity management information systems, processes and infrastructure. A technology expo of latest solutions for border management will be held concurrently with the conference. The conference, exposition and networking sessions will provide excellent business development opportunities, enabling suppliers of products and services to build relationships with end-users in the border management business. Attended by decision-makers from government and development agencies from over 50 government agencies from 42 countries in Asia, Australasia, Europe, EMEA, and the Americas. THE BEST opportunity to meet your peers from government agencies responsible for border management, secure documents and identity management in Asia! The business mecca for experts in border and identity management.The BMIC is an excellent opportunity for all the key stakeholder groups - government authorities, international organisations, development agencies and solutions providers - to network and build relationships to improve order and identity management in the Asian region. The 5th Border Management and Identity Conference on Technical Cooperation and Capacity Building is the largest regional meeting focusing on national border management and identity. National government agencies involved in Immigration, Border Control, Customs, e-Passports, Refuge and Asylum Management, Law Enforcement, Justice & Security, Communications & Technology, and other agencies with responsibilities in the area of Border Management, are entitled to participate in the conference free-of-charge. 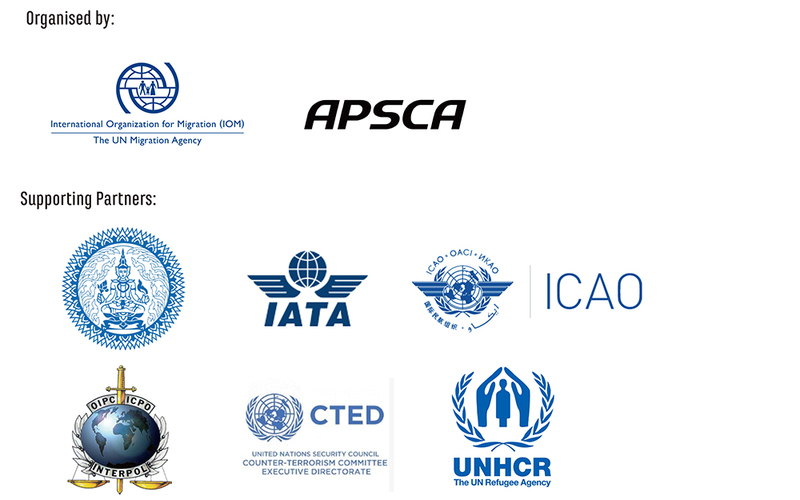 APSCA and the IOM will be inviting international organisations to share information about refugee and asylum management they have implemented and share their best practices. Companies providing solutions for border management in the following areas listed below are invited to participate in this event. Contact the APSCA office for information about our available sponsorship and exhibition packages. The 5th Border Management and Identity Conference on Technical Cooperation and Capacity Building represents the best business development opportunity in Asia. In sharp contrast to commercial conferences and exhibitions around the world, participating companies can expect to be outnumbered by their existing and potential government customers at the conference in Bangkok.